You are currently browsing the tag archive for the ‘alfalfa cubes’ tag. Pepper is a mare that knows what she likes. She’s discerning when it comes to her food. Some might even say she’s picky. A few months back she decided she liked a handful of crushed alfalfa cubes spread over her grain. Back then we were just being practical and using up every bit of the feed we’d purchased. And we knew Pepper needed all the calories we could give her to hold her weight through the winter. Well, we created a bit of a challenge, because NOW the ever-watchful Miss P. EXPECTS a sprinkling of alfalfa bits. She’s not interested in eating her grain without it. Problem is we don’t always have these bits. They’re what’s left at the bottom of the hay cube bag. 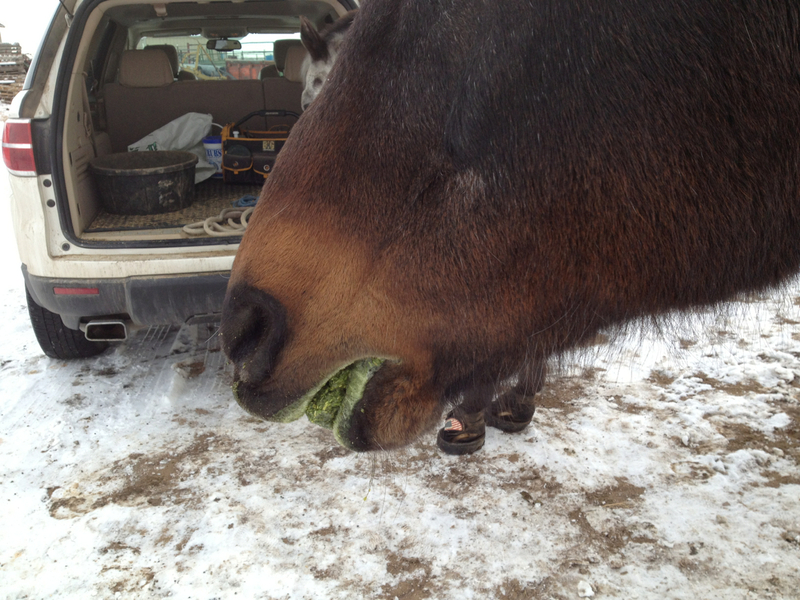 We’ve taken to doling them out and sometimes crushing a cube or two to get the desired alfalfa crumbles. As if we don’t already have enough to do when it comes to taking care of the two old sweeties. But in truth, we can only blame ourselves, since we introduced the alfalfa bits in the first place. Have you ever innocently started something that eventually took on a life of it’s own? I’m guessing parents can add some interesting stories here. I understand what Pepper is going through. At our house we’re in the process of retraining our taste buds (yet again!) away from holiday goodies and back to healthy eating. Somehow kale salad doesn’t hold the same appeal as frosted sugar cookies, carmel corn, and pumpkin pie. But we’re working on it! What’s your favorite healthy snack? Let’s make a list. P.S. Pepper wants to add for the record, that in her opinion, alfalfa crumbles ARE a healthy snack. She can’t understand what the problem is. How do we argue with that logic? Yesterday when we were out feeding our two old sweeties, we noticed two horses hanging out at the edge of the Herd of Oldsters. They were new to us – probably new to the pasture. They watched every move we made as we let Bud and Pepper through the gate and then began our ritual of handing out alfalfa snacks. The Herd of Oldsters is something like Ellis Island was for newcomers to the United States all those years ago when it was the first stop in America. 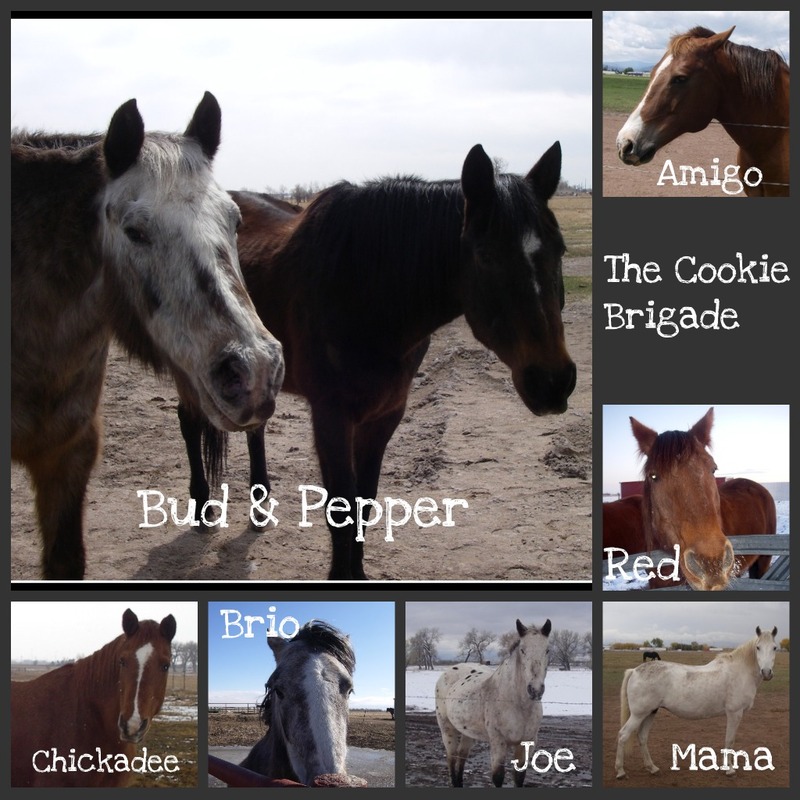 All new horses to the pasture seem to start with the Oldsters. It makes sense. The Oldsters are safe. There are no shenanigans. No fights for dominance. No chasing games. As long as the newcomer isn’t too pushy, things are good. Eventually most move on as they find their own herd. Occasionally one stays, as was the case with Atticus. He knew a good thing right from the start! Something about this gelding and mare called us. They looked sad. They had no energy. 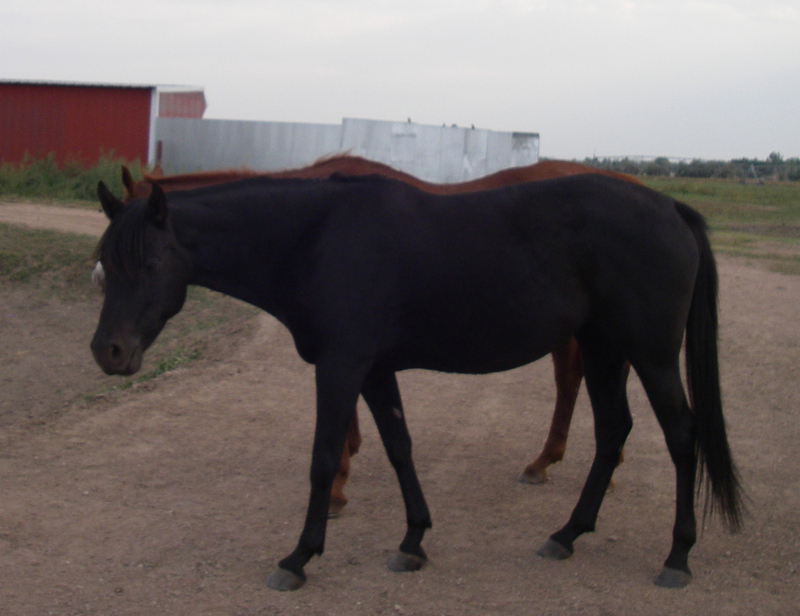 His companion, a black mare was in better shape. In fact she was a little on the pudgy side, though we didn’t tell her that. Never, under any circumstances, tell a female she looks pudgy. Then we taught them the Hay Cube Toss Game, which they mastered very quickly. In fact they continued to search the ground for more cubes, as if these green cubes of yumminess simply sprouted up on the ground. I guess they hadn’t figured out who was tossing them. That will come soon enough. Someone will enlighten them about the snack lady. We’ll see what happens in the next few days. Bones and Ebony may stick around and become part of the Herd of Oldsters. Or they may move on. For now, we’ll help them feel welcome. And make sure they’re on the receiving end of snacks. I love how my brain works, the associations it makes, the memories it gives me. And as for the title of this post, it all goes together, at least in my mind! I’ve told you many times how Miss Pepper loves, loves, loves alfalfa cubes. They are her favorite treat. A few cubes after dinner is pure bliss for our girl. These days I have to break them into smaller pieces when I give them to her. A large, hard cube is too much to handle. When she gets a bite of cube that’s too large, she holds it in her mouth, softening it until she can chew it. Sometimes she’ll roll it around, kind of flipping the cube with her jaws, I guess so that she can get all sides soft. She produces a LOT of saliva during this process, which turns into a slimy stream of green goo. This part isn’t terribly attractive, but as we age, there seem to be more and more of those not-so-attractive things happening to us. Watching Pepper soften her cubes before eating them brought me a flash of memory from my childhood. My paternal grandmother was a dunker. She’d dip just about anything into her coffee. Cookies, toast, and bread were three of her favorites. I vividly remember one morning when she was staying with us when our parents were out of town. I’d gotten up early and the two of us sat at our family’s dining room table dunking toast into coffee. She’d given me a cup of milky coffee, which made me feel exceedingly grown up. Still today as I write this I can almost taste the buttery, crisp toast and how it melted into the coffee as I dunked it. I can see the oil slick from the butter on the surface of the coffee. And I can see my grandmother as clearly as if we’d shared toast and coffee just yesterday. It’s such a sweet memory. And now I wonder if she dunked hard foods into her coffee because like Pepper, it hurt her mouth. My husband and I recently went to see this movie. We both loved it, though Rick’s comment was that he thought you had to be a certain age to “get” it. It has a stellar cast of British actors and a story that totally resonated with us. The part about the film that connects to this blog post was something Judy Dench said. 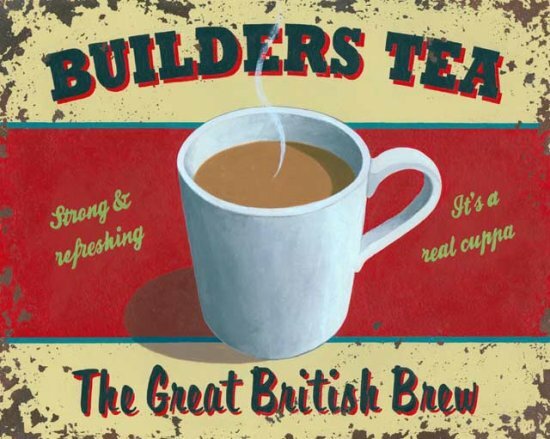 She was helping her Indian employer understand Builders Tea, which is apparently a staple in the British diet. It’s strong, black tea that is softened with milk and sugar. That line catapulted me back to my childhood dining room adventure with my grandmother, and then zig-zagged me to present time and Pepper softening her hay cubes. And somehow my lovely brain brought it all together. I’ve been tinkering with genealogy and have learned (no great surprise here) that we have strong ancestral ties to Britain. My grandmother dunking toast in her coffee became something much more than a simple breakfast act. It became a link to our heritage. So there you have it – a look at how my brain works. I’m still the same Jean you’ve come to know in this blog. It’s just now you’ve had a peek behind the curtain. I’m guessing you do the same thing. Come on, tell me about it. P.S. Sometimes my husband is the tiniest bit afraid. My father was the short-order breakfast cook in our house. I don’t remember my mother ever making breakfast for us, though I suspect at times she did. But it’s my dad that I can still see, standing at the stove, scrambling eggs, pouring orange juice, and buttering toast. He and my mother shared cooking duties for the other two meals of the day, but breakfast was his domain. It was a bit of a shocker for me to learn as an adult that all men did not cook breakfast. My husband falls into that category. For a good part of his adult life he owned a restaurant, so people assumed he was a cook. He appreciates a good meal, and is my biggest fan when it comes to cooking, but it’s not his thing. He can mix up the best concoction of grain Miss Pepper has ever tasted. As far as she is concerned, Rick is the best “cook” ever. And I must agree that his grain mix does look inviting. His secret ingredient is tiny shredded bits of alfalfa. He scoops them from the bag of cubes and liberally mixes them into the grain mix, which already consists of two kinds of grain, and shredded beet pulp softened in water. He even includes a few chunks of alfalfa cube. And let me tell you, Pepper is in heaven. She’s a salad girl. Loves her greens. Those little chunks of alfalfa make her nearly swoon with delight. When Rick does the “cooking” for her, she almost always licks the pan clean. The problem is, we don’t always have access to shredded alfalfa cubes. They come when we’re close to the end of the bag. So Rick’s mix is a treat. Like going for ice cream on a Sunday afternoon. I’ve tried to replicate the mix, and do an okay job of it, but nothing compares to Rick’s version of the super duper grain mix. If you’ve been reading the blog for a while you’ve met these characters many times. And if you’re a new reader, welcome! Soon enough you’ll be on a first name basis. Occasionally another horse or two gets into the mix, but on a consistent basis, this is the group that lines up at the fence for treats. They know me. I consider them to be my friends and I think the feeling is mutual. As I hand out alfalfa cubes or horse candy, we talk. Well, to be a bit more precise, I talk and they listen. I ask how their day is going. I comment on the weather. I hand out compliments, because who ever gets enough of those? I recently learned that some of the other boarders have been watching me. Behind my back I may even be called “that crazy horse lady.” No one’s said it directly to me, but you know how you get a vibe? What I have heard is, “Oh, so you’re the one that feeds her horses out of the back of the car.” I nod yes, wondering briefly what they’re really thinking. Then I let it go, because really, I don’t care. It’s one of the benefits of aging. I’m much more comfortable in my own skin. A few days ago, Red’s people were having a visit with him. He’s such a sweet old guy, even when he believes his own PR about being a wild and wooly Mustang. So there he stood with two mothers and four preschoolers fawning over him. He was the soul of discretion, and being so careful with the little ones. But a small part of him was looking longingly toward me handing out goodies. He seemed torn – so glad to see his people, but hating that he was missing out on his share of treats. Even his owner noticed. “I think he’d rather be in the “cookie brigade,” she said. That’s how our new nickname was born. The Cookie Brigade has a nice ring to it, don’t you think? By the way, I think she was mistaken, because Red appeared to be totally grooving on all the special attention he was getting. It always makes me happy when one of our oldsters gets to spend time with his or her peeps. Now when you hear me use the term Cookie Brigade in future posts, you’ll know exactly what I’m talking about. It’s just an old white plastic bucket repurposed from some other function into holding Pepper’s favorite thing in the world. These little green chunks of alfalfa make her tail fly up. They are the Oreo cookies of the horse world. Or maybe the mini Snickers bars. ** Feel free to insert the name of your favorite snack here. She keeps one eye on the bucket at all times. It may look as if she is munching away on her pan of grain, but make no mistake; she knows exactly where the bucket is located. Lately it’s been on a post close to the gate. 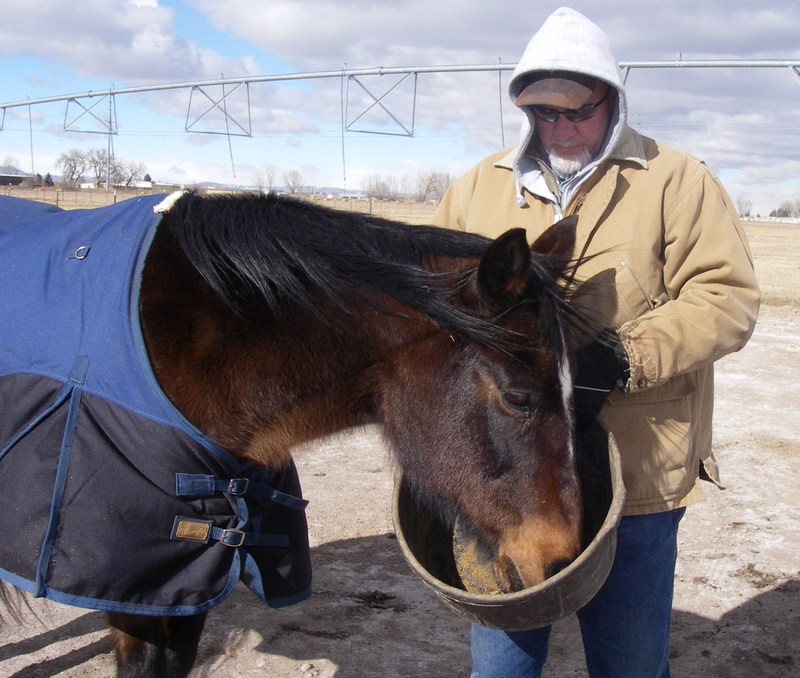 Long ago, before she became so savvy, we were able to store the bucket in the back of the car or truck, along with the feed pans, lead ropes and other horse paraphernalia. But Pepper caught on and couldn’t concentrate on eating her grain. All she wanted to do was bury her face in cubes and snarf them up. We had to resort to Plan B – move the bucket out of her line of sight. It’s worked fairly well, that is until Pepper gets a hankering for cubes. When that happens, Plan B flies out the window. I’m never sure what triggers her desire for hay cubes. Then again, I’m never sure what triggers my “need” for Twizzlers or candy corn or any of the numerous other goodies that light up my brain. 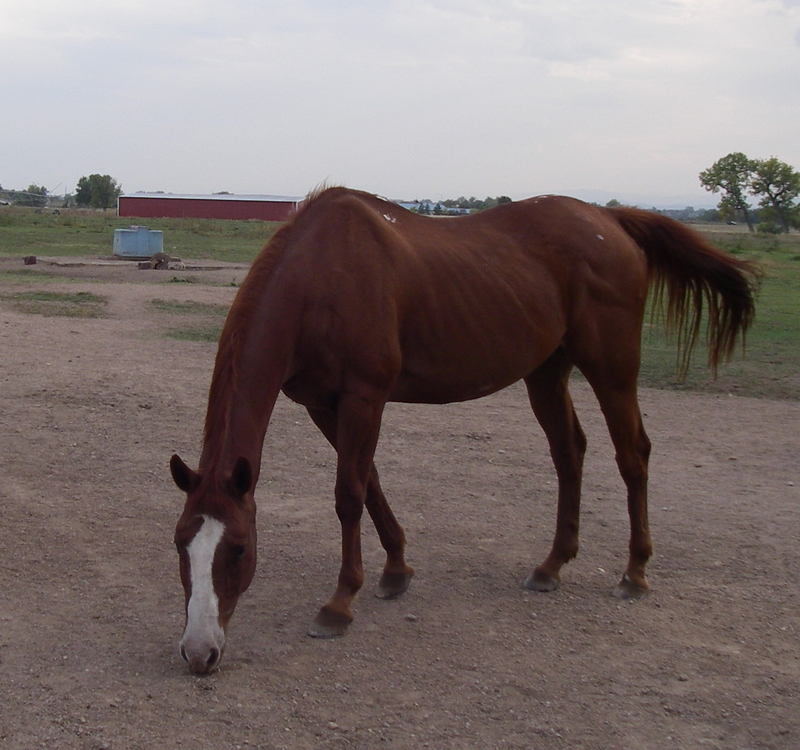 So yesterday, I was walking Bud through the gate into the pasture. He’d finished eating first – like always. Pepper had several large handfuls of grain yet to eat, so I figured all was well. Once my back was to her, she got the craving for cubes and made her way to the bucket, which you can see from the photo is balanced quite precariously on a post. She nosed the bucket to the ground and began eating her beloved cubes. I scurried back to find alfalfa cubes scattered among the dry grass and tumble weeds like an autumn Easter egg hunt. I scooped them into the bucket nearly as fast as Pepper ate them. In the end I think I salvaged more than she ate, but it was close. “Never mind,” I muttered as I led her through the gate. It was just another day in the pasture. Load up grain and drive to the pasture. 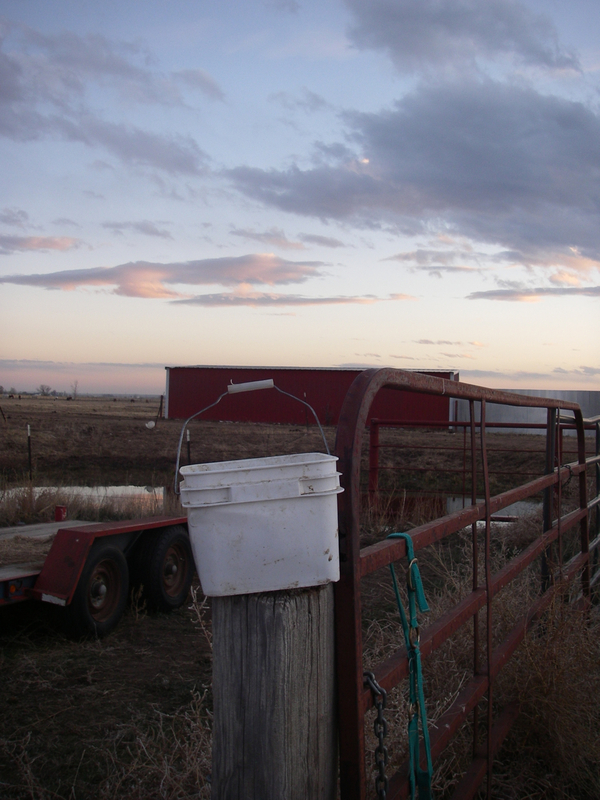 Set feed pans on the back of the pickup and open the gate, making sure not to let the whole herd out – just our two old sweeties. Hand out treats to the Herd of Oldsters who glue themselves to the fence line, so we can’t help but see them. I sing and talk and stroke noses (not mine.) For the record, Rick doesn’t sing to the horses, but on occasion he’s been known to talk to them. Brush Bud and Pepper while they snarf down their medicine-laced grain. Move to the dessert bar and dispense hay cubes and/or horse candy to our sweeties. Lead them back through the gate. Bud and Pepper have this routine down cold. They know it better than we do. Most days when we pull up, they’re standing at the gate, waiting for us. I wonder exactly what time they mosey to that part of the pasture. How long do they actually stand there waiting for us? And what do they do on those rare occasions when we don’t come out to feed? I worry about that, but they don’t hold it against us. 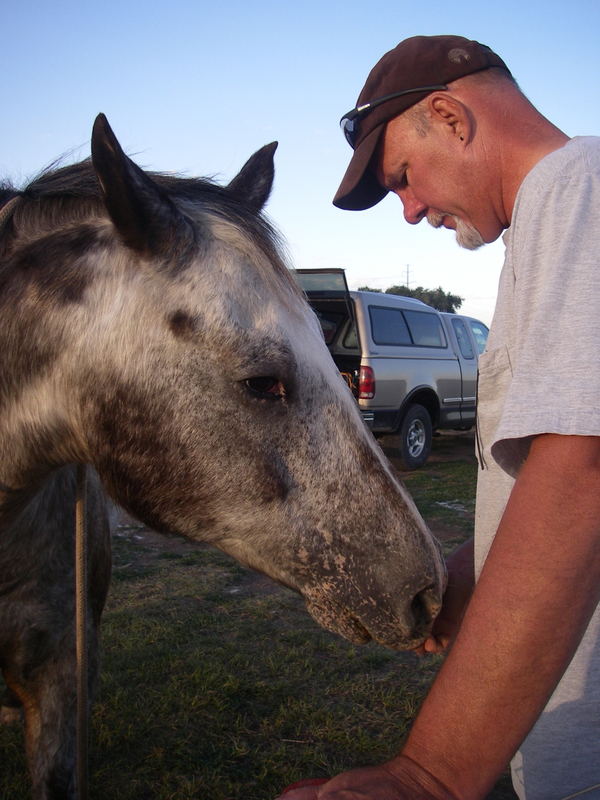 Forgiving animals – our horses. Last year I set up the dessert bar because I had to move the snacks out of Miss Pepper’s line of vision. She was having trouble concentrating on her grain. All she was interested in was nosing into the bucket of snacks and stuffing her mouth with hay cubes. I assured her I could relate, but nonetheless, she had to finish her dinner before she could have dessert. I had a lot of practice being a mother. Can you tell? 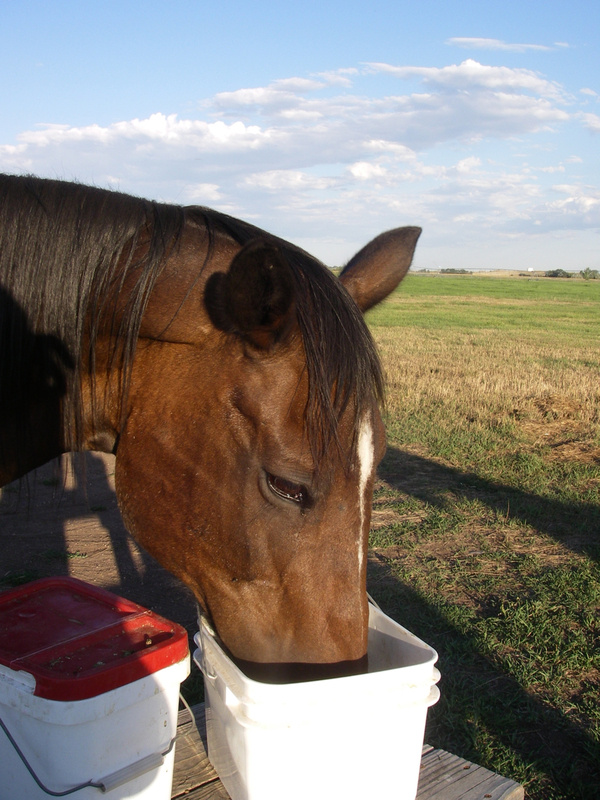 So now, our horses know that when their grain pans are empty, they’re allowed to move to the dessert bar for, well, dessert. Other horse owners watch us and shake their heads. I’m not sure it’s awe or embarrassment. We do let our sweeties get away with behavior other folks would probably not tolerate. We figure they’re retired and have earned the right to be pampered. And if others don’t agree-to each their own. On many days Bud and Pepper put themselves back into the pasture, though they need us to help with the latch. They know the drill. Smart animals – our horses. Miss Pepper and I share a weakness. It’s a flaw really in our otherwise sterling characters. You see there are certain foods that we love to eat. Love to eat so much that we’re tempted to overeat them. They call to us in an oh-so-tempting whisper, like a voice you’d hear in a science fiction movie. “Oh Jean,” they sing in their sultry, seductive voices. In the early stages, I’m usually able to resist. But they’re prepared for that. These sirens are patient and sneaky. They just keep calling. Eventually the voices win and I walk to the kitchen, open the cupboard and break into the package of cookies. Once they’re open it’s much easier to slip one or two out. Oh, I don’t eat the entire package at once. That would be gluttony and I’d be sick. No, the sirens are ever so much more subtle. Over the next few days, they cajole and I respond. Here a cookie, there a cookie, everywhere a cookie, and before I know it, the package is empty. Gone. No more Mint Milanos and the only thing to show for it is a slightly snugger fit to my jeans. Pepper has a little different story, though it’s still about hearing voices. She has a particular fondness for alfalfa cubes. And even though she loves her latest feed mix of grain and shredded beet pulp softened in water, she thinks about those delicious green cubes. They call to her, just as the cookies call to me. I’ve had to remove the white bucket of cubes from her line of sight, or she won’t eat her grain. 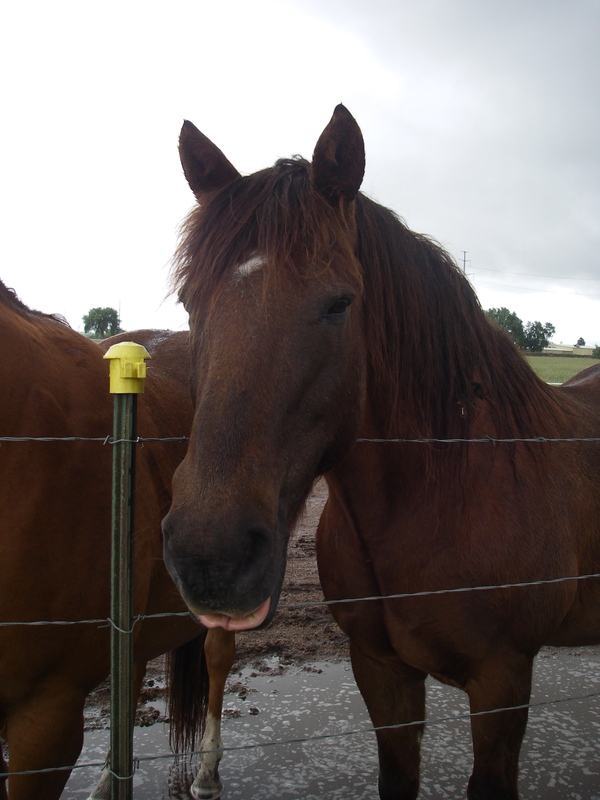 You may remember that this summer we had to set up what I called the “Dessert Bar,” where we put the hay cubes and horse candy out of Pepper’s view until she ate her grain. We’re in a new pasture for the winter and there’s no good place for the dessert bar. I put them on the side of the car where Pep won’t see them. This worked for a day or so, until our smart girl figured it out. Somewhere in the middle of eating her grain, the hay cubes call to her. They continue calling until she stops eating grain and saunters around the car in search of the cubes. She quickly learned where I was hiding them. Then I resort to locking them in the back seat of the car and remind her she has grain to finish. In the photo above, Rick is the enforcer. “Eat your lunch,” he says in a stern voice. On the day that particular photo was taken, Miss. P. ended up cleaning her plate, so to speak. We were ecstatic because it meant she got the full dose of Bute, which isn’t always the case. Then she was allowed to indulge in a few hay cubes. Eat your meal first and then you can have dessert. Isn’t that the mantra of every good parent? I solve my Milano issue by simply not having them in the house. Most of the time that works – unless they start singing to me in the grocery store. I have to be especially vigilant when I’m shopping in the late afternoon, because the song is strongest then. So what calls to you? Come on, I know there’s something. 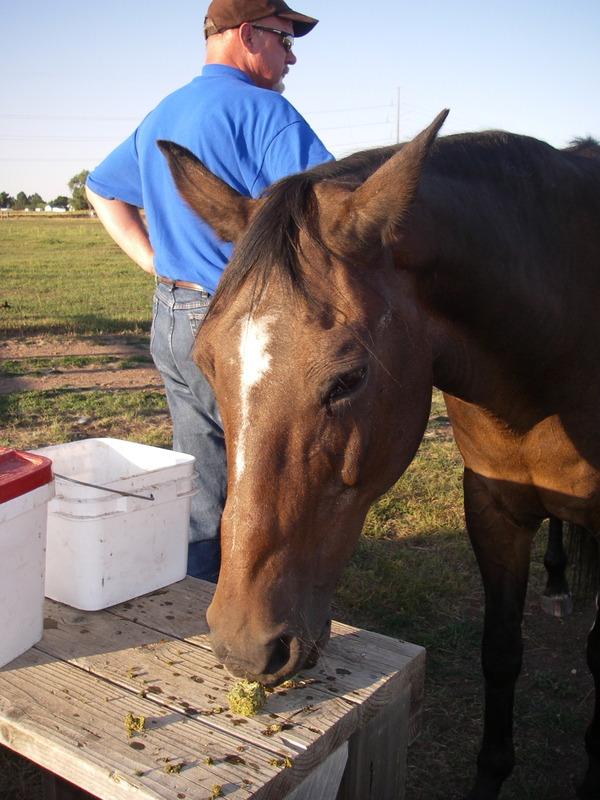 We’re human (or equine) and we have cravings. Is it sweet or salty? I know folks who can’t have a box of Wheat Thins on the premises. Or chips. So what’s your weakness? Pepper and I want/need some company. P.S. Please don’t call the authorities about this whole “hearing voices” thing. Really we are both quite sane. This quotation from author Ernestine Ulmer seems to be Pepper’s new motto. About a week ago we started something new when we were feeding our two old sweeties. 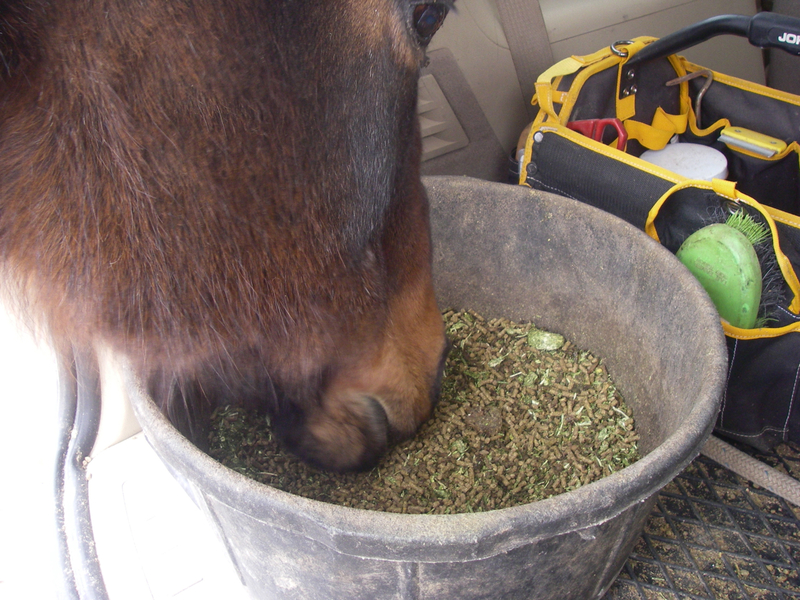 We moved the bucket of Horse Candy and the bucket of alfalfa cubes away from the back of the pickup. There’s a wooden mounting stand a few feet away, closer to the fence and the rest of the hungry herd. We set the two buckets there. We moved the goodies to set up a separate coffee and dessert bar. Something upscale for our horses. We moved them because Miss Pepper couldn’t concentrate on eating her grain, which is dosed with Bute. 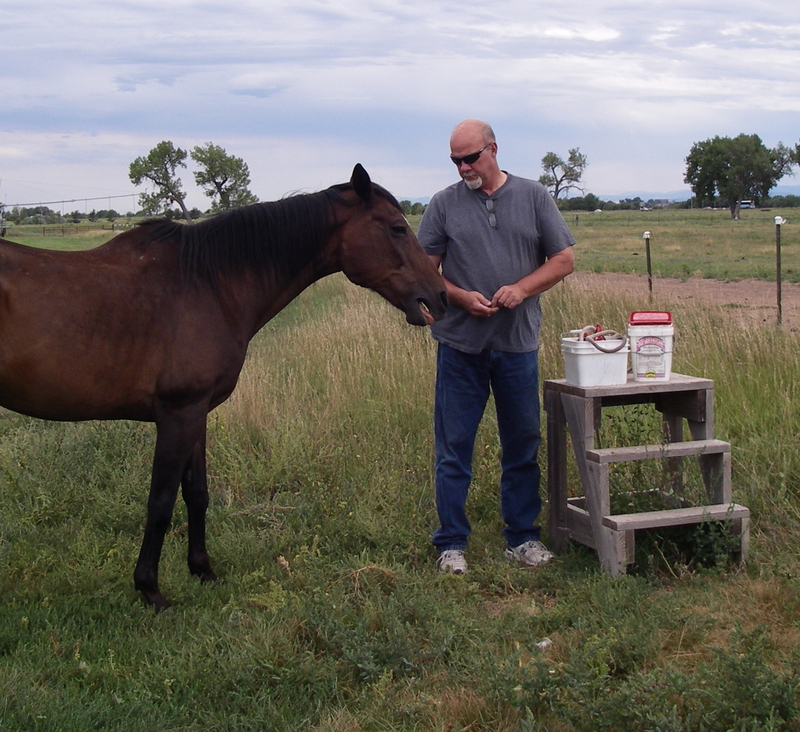 It’s made a huge difference in the pain in her old, arthritic knees, so getting the medicine into her is important. My husband came up with the idea to remove the goodies from Pepper’s line of sight. It was a good idea, and worked well for a few days. When she and Bud finished their grain she would lead them to the dessert bar for their treats. But Miss Pepper is one smart cookie. Last night when we opened the gate, she walked straight to the dessert bar. No more messing around with the grain. She was all over eating her dessert first. She dipped her head into the bucket of alfalfa cubes and began eating. She seemed quite pleased with herself. Rick got her pointed back to the truck and her pan of grain. She took a few nibbles and as soon as we weren’t looking, back she walked to the dessert bar. See what I mean about her being smart? Once again we re-directed her to the pan of grain. Big sigh from one brown mare. And then slowly she began to chew her grain, bit by bit. You’d think it was poison. A couple of times she looked toward me, her brown eyes pleading for an invitation. I had to make sure I wasn’t looking directly at her. I have no willpower. Have you figured out that I am the indulgent one in our family? It’s not a big leap. Finally, she was finished with her dinner. Right away, she walked to the dessert bar, her head high. “Now I know you won’t send me back,” her expression seemed to say. Of course, she was right. She gulped down as many snacks as she could possible get into her mouth at any one time. She looked like a contestant in a pie-eating contest at the County Fair. Bud was still at the truck, gleaning up every bit of grain he could find. He hasn’t quite figured out the new system. Eventually he ambled toward Pepper, who was still happily munching on treats. Who knows how long she would stand there sampling dessert? What woman in her right mind could answer such a question? I can’t wait to see what Miss Pepper has in mind for tomorrow. I love how she keeps us on our toes. I seem to be on a food kick lately. Hope you don’t mind. We’ve been part of Community Supported Agriculture (CSA) for several years now. Every week from June through October we pick up our share of veggies from Happy Heart Farm. It’s a wonderful way to eat local, support small business farmers, and have a supply of fresh, organic, delicious vegetables. The lettuce we’re enjoying right now has only traveled a few miles from field to our table. It’s wonderful – tender and sweet. So right now at the farm the greens are coming on like gangbusters. Over the course of the growing season we typically get a lot of kale and chard. Both are power-packed veggies, so good for a person it ought to be illegal to eat them. My husband agrees with the making them illegal part, though for a different reason. He’s suffering from chard/kale burnout. This isn’t a good thing so early in the season. He/we have many servings of kale in our summer future. Last year the kale and chard were prolific. Every week I’d carry armfuls home from the farm. I steamed it, braised it, put it in soups and stews, and even ate it raw in a few salads. Neither of us was fond of that last option. I don’t think Rick is alone in his lukewarm relationship with kale and chard. I’m betting most men would land on Rick’s side if a vote were taken. For some reason, men don’t really love greens. I know I’m making a sweeping generalization here, and I welcome your comments to the contrary. But in my small sample of one or two men, kale and chard always lose. Remember Red, Pepper’s mustang boyfriend? He’d be on Rick’s side. I’ve talked about the alfalfa cubes and how Miss Pepper loves them. 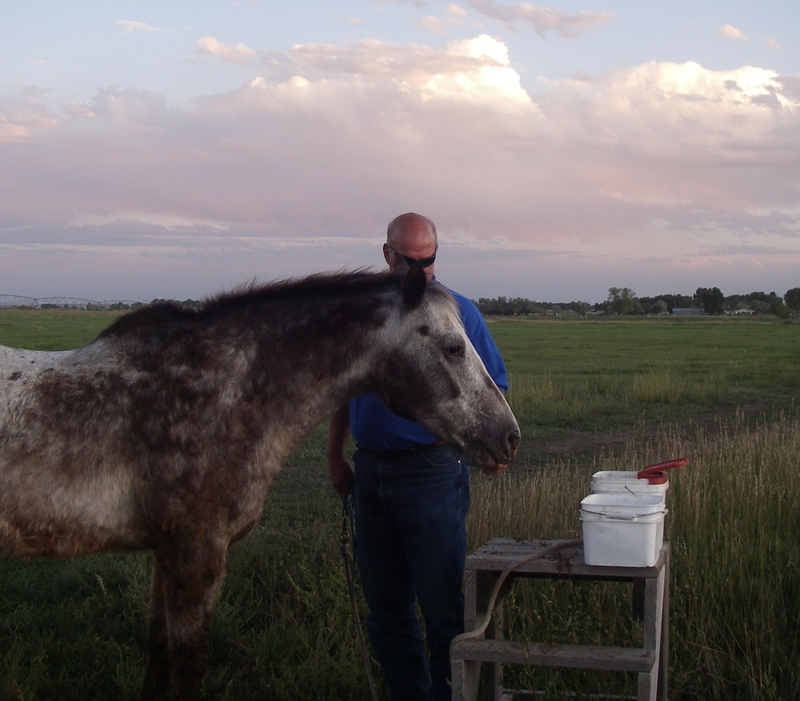 I’ve told you how Rick plays hay cube toss to entertain him and the horses. The one horse out of our little band that isn’t thrilled with the cubes of dried green is Red. Proud traveler of the plains. Wild man of the west. This bad boy has a sweet tooth the size of Nevada. He and Bud share a fondness for Horse Candy. When I hand out treats, Red is first in line, waiting not too patiently for his share of the sweet morsels. Every so often I slip in a hay cube. And most of the time, Red spits it out. The look of disappointment in his eyes is almost painful to me. If I weren’t smiling, that is. It kind of amuses me. The way his face looks when he gets that first bite of alfalfa cube looks very similar to Rick when he sees that kale is on our dinner table. Perhaps the only difference is that Rick doesn’t spit it out. In fact, he graciously eats whatever I cook. He’s learned that about making marriage work! How about you and your family? Greens eaters or no?